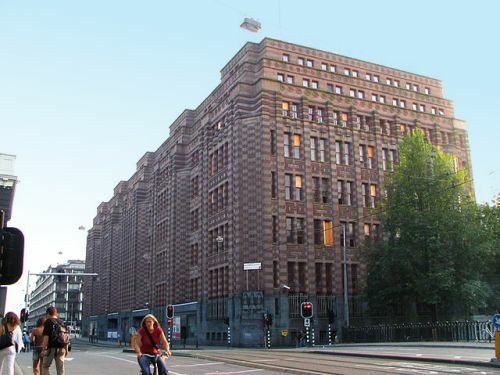 Housed in the monumental Brick Expressionism style De Bazel, the Amsterdam City Archives preserves official documents, letters, photos, drawings, maps, prints and audio-visual records tracing the history of the city. Housed in the monumental Brick Expressionism style De Bazel, the Amsterdam City Archives preserves official documents, letters, photos, drawings, maps, prints and audio-visual records tracing the history of the city. Highlights include the Westerkerk burial register recording the burial of Rembrandt van Rijn on 8 October 1669; the book containing the excommunication of 17thcentury philosopher Spinoza; an 18thcentury trade agreement between the city and the newly founded United States of America; a letter from Charles Darwin to Artis Royal Zoo from 1868; archives of Heineken, De Bijenkorf and the Concertgebouw; letters from Mahatma Gandhi; the 1942 report of the theft of Anne Frank’s bicycle, and a 1976 portrait of Dutch entrepreneur Freddy Heineken. The Stadsarchief also organizes exhibitions, tours of the collection, and archival film screenings.